Imagination Technologies reports that a multi-core processor from Russian fabless IC company Baikal Electronics integrates ImgTec’s latest MIPS Warrior P-class P5600 CPU. Baikal created the Baikal-T1 with a focus on versatility, high operating frequency and low power consumption to allow its customers to build efficient solutions for telecomms, industrial automation and embedded systems. Baikal selected the MIPS CPU because of its balance of high-performance processing with small silicon area and excellent low power credentials. 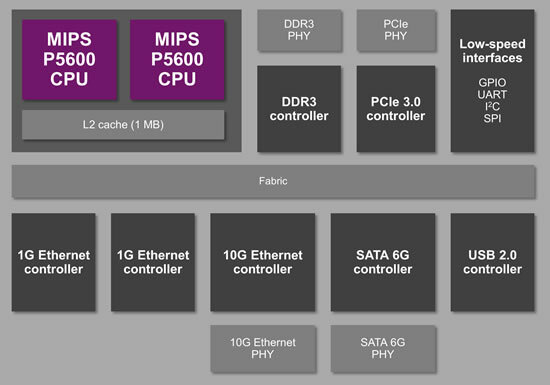 The MIPS P5600 CPU is based on a wide issue, deeply out-of-order implementation of the MIPS32 architecture, supporting up to six cores in a single cluster with high performance cache coherency. It achieves the industry’s leading CoreMark/MHz score per core for licensable CPU IP. The OmniShield-ready P5600 also integrates hardware virtualisation for increased security and reliability, and 128-bit SIMD support for high performance on data parallel operations such as DSP, imaging and media. Engineering samples of Baikal-T1 are available to developers now from Baikal. The SoC comes with a set of extensible software based on open source code.